This report includes trends in food and beverage sales, businesses openings and closings, commercial space inventory, business and development news and properties for sale or lease. The goal of this report is to track the market of Raleigh’s Hillsborough Street Municipal Service District with data and metrics on a semiannual and quarterly basis. Download the latest report below. 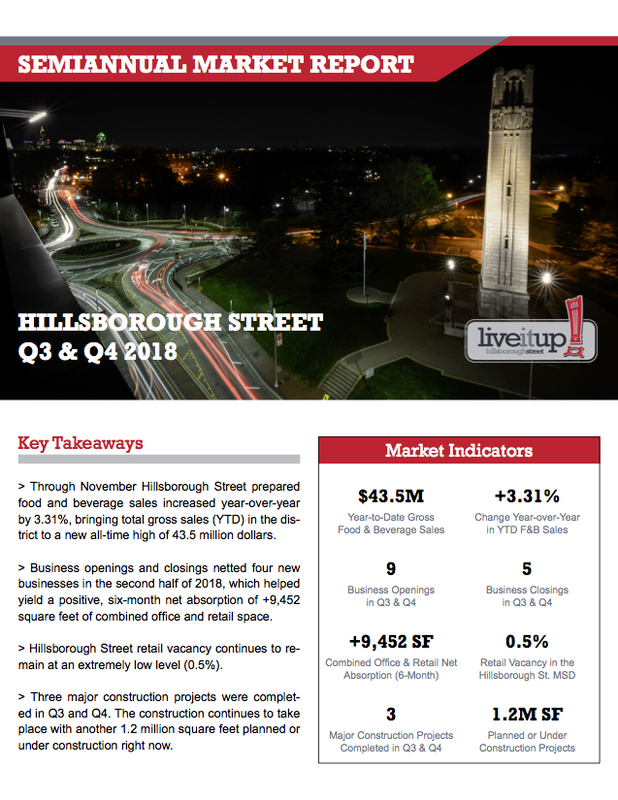 Through November Hillsborough Street prepared food and beverage sales increased year-over-year by 3.31%, bringing total gross sales (YTD) in the district to a new all-time high of 43.5 million dollars. Business openings and closings netted four new businesses in the second half of 2018, which helped yield a positive, six-month net absorption of +9,452 square feet of combined office and retail space. Hillsborough Street retail vacancy continues to remain at an extremely low level (0.5%). Three major construction projects were completed in Q3 and Q4. The construction continues to take place with another 1.2 million square feet planned or under construction right now.